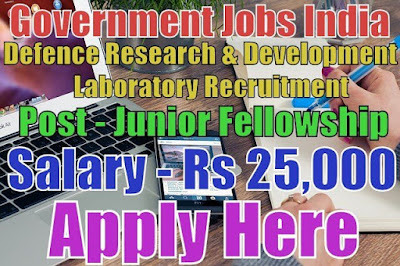 Defence Research and Development Laboratory DRDL recruitment 2017 notification (Defence R&D Organization) for 18 junior research fellowship posts. All legible and interested candidates can apply on or before (30-04-2017). Further more information about salary details, application fee, educational qualifications and all other details / information about this post is mentioned in detailed below. 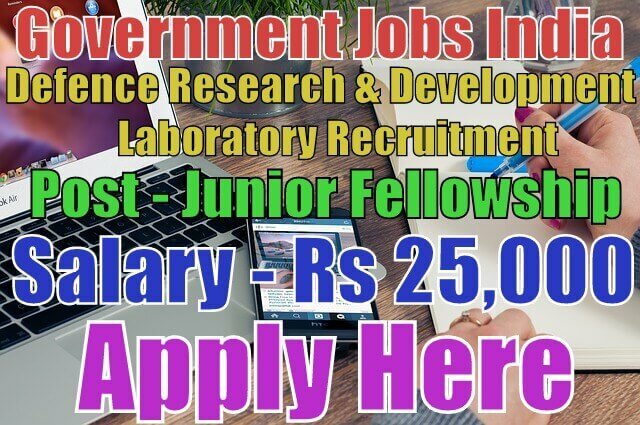 Salary/Pay and Grade Pay - For junior research fellowship, the payable salary will be Rs 25,000. Further more information about salary details as post wise is mentioned in detailed advertisement. Age Limit - For drdl recruitment, candidate age should be less than 28 years as on (01-04-2016). To know more about age details click on detailed advertisement. Educational Qualifications - Candidates have must done 10th, 12th, B.E/B.Tech with first class in mechanical / aeronautical engineering from UGC university and M.E/M.Tech with first class in mechanical / aeronautical engineering with GATE/NET valid score or it's equivalent / relevant / higher qualification from a recognized board or university. To know more see advertisement. If you are not graduated then, click here for 10th and 12th based jobs. Selection Method - For junior fellowship post, candidate will be selected on the basis of their performance in personal discussion and then personal interview. Candidates must be prepared for these tests. Work Experience - Candidate must have some experience in their desired fields. How to Apply - All legible and interested candidates have to download application form from official website www.drdo.gov.in/. Candidates have to take printout of application form. After printout, candidates must fill the application form and send the application form along with needed / relevant / required testimonials(which is mentioned in detailed advertisement) superscribing the envelope "Application for the post of 'Name of Post' " to the given desired address. Application Fee - There will be no application fee for any category candidates. Candidates belonging to ST/SC and person with disabilities are not required to pay any application fee. Regular employees of drdl applying for higher position are also not required to pay any application fee.